The heaviest rig putty in the world. Super concentrated with micro grade tungsten makes it over 200% heavier than alternative putties currently on sale. Due to its extreme density only small amounts are required to counterbalance pop ups precisely. Simply add or remove the required amount for perfectly balanced baits. Excellent adhesion. Superb elasticity. Fully re-usable. Non toxic. Used and endorsed by the world’s leading anglers. 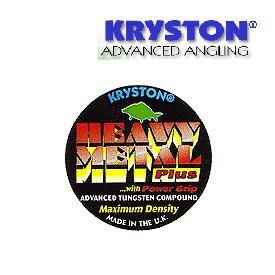 Use Heavy Metal Plus™ with extra grip for fishing in hot weather. FREE Delivery on all Kryston Hooklength / Shockleader / Braid over £100!! !